The interrelations between accounting and food have been hitherto neglected at an international level. This regret is particularly meaningful with regards to Italy, where 'Food', besides being a physiological need to satisfy, is one of the main pillars of the 'Made in Italy' Industry, and the so-called Italian life-style, which has become a part of the popular culture. Accounting and Food seeks to explore the accounting, business and financial history of some of the most prestigious Italian food producers. Moreover, given that "Food" has been at the center of production and trade throughout the history of mankind, food production and commerce will be investigated from the critical angles of accounting, accountants and merchants. Relatedly, the interconnected history of the Food fairs and expositions of the major Italian trade centers will be also unveiled. Accounting and Food examinesthe role of accounting, accountants and merchants in food production and international trade (e.g., grain, wine, etc…) as well as considering the history of food producers, paying particular attention to the role played by women entrepreneurs over time. 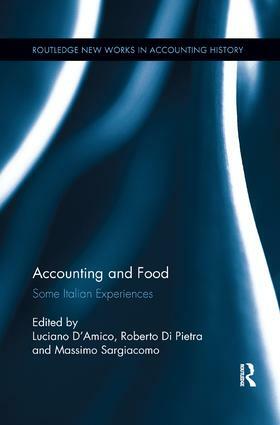 Finally the book explores the interrelations of accounting, food and state, local authorities and social institutions, in particular in so far these latter institutions were involved in the Political economy, regulation, allocation and distribution of food to populations and societies. Accounting and Food will be of particular interest to researches and scholars in the field of accounting history but also to those working in the areas of regional development, regional economics, food and sociology and other related disciplines.